Original contemporary music from the rocking world of Dave Jenkins of "Pablo Cruise"; and the Island style Hawaiian Slack Key world of Kapono Beamer of the "Beamer Brothers". Nominated for Hawaii Group of the Year. Kapono Beamer and Dave Jenkins met through mutual artist friend and famed environmental impressionist painter, George Sumner. They began writing songs together that were inspired by their shared love for the beauty and spirit of Hawaii. Soon it became apparent that these new songs would make a great album production. Believing strongly in the new music they were creating, Kapono and Dave invested their own time and resources to form "Luster Bros. Records", to release their first CD together. Both bring diverse and eclectic influences to the musical table. Dave Jenkins comes out of a solid background of national hit records from his years with "Pablo Cruise". He reached heights attained by only a very select few in the music business. As a songwriter, guitarist, and lead vocalist he will forever be a part of pop music history with gold albums and two double platnium albums to his credit. He brings an aggressive grooving songwriting style laced with romantic images of tropical escapism, and his incredible lead vocal talents give immediate identity to the Beamer/Jenkins collaboration. Kapono Beamer grew up immersed in Hawaiian music. He developed his talents during years of recording and performance with the "Beamer Brothers", whose "Honolulu City Lights" remains one of the most successful selling records in the history of Hawaii. Kapono brings a complex yet gentle Hawaiian soulfulness that is expressed in his unique slack key guitar tunings and his sweet vocal harmonies. Kapono also brings unique sounds such as the Hawaiian nose flute to the production, and his lyrics reflect concerns as well as celebrations of life in Hawaii. 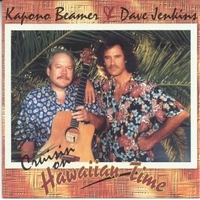 "Cruisin' On Hawaiian Time" has been a labor of love for Kapono and Dave... A love born out of a deep appreciation for all that is Hawaii today. "Cruisin' On Hawaiian Time" is more than a collection of great songs from two talented songwriters and recording artists. It's an attitude, a lifestyle, a dream that never grows old.